The sailing team put in hard hours on Friday, docking out near 1030 and not returning to shore until well after 1800, as the last light of the day was rapidly fading. Friday evenings are usually 'taco night' at the base, with families invited down to celebrate a good week of work. This Friday was no exception and the team was joined by Larry Ellison, team owner and afterguard member, who came down to San Diego to spend some time with the team. He spent several hours at the base and paid tribute to the full crew, in particular the boatbuilding team, who he thanked for their 'herculean' efforts in getting the BOR 90 back on the water for the latest testing session. "What you have done in the time available is simply incredible," he said, before joining the team for tacos. It'll be an early night though. The boat is scheduled to sail again on Saturday as testing continues. On Friday, the BOR 90 returned to the waters off Point Loma for the second consecutive day of testing since the boat was recently relaunched. Out on a chaseboat following the team were representatives from CNN Mainsail, Yachting World magazine and the Scuttlebutt electronic newsletter. CNN Mainsail host Shirley Robertson had an opportunity to spend some time on the BOR 90, interviewing the crew as it left the dock this morning. Having earlier been out on the Alinghi catamaran, she may be the only person on the planet to spend time on both boats. "It's quite special isn't it? It's a fantastic privilege to have been on both boats," said Robertson, who holds two Olympic Gold Medals in sailing, and knows her way around multihulls from competing on the iShares circuit, where she races against many top level sailors, including BOR 90 helmsman James Spithill. "It's interesting, I didn't really get a sense of the scale of the BMW ORACLE Racing boat was until I was off the boat. It looks amazing, especially with two hulls out of the water. It looks absolutely, fast." During her time with the team, Shirley was able to interview CEO and skipper Russell Coutts and team owner Larry Ellison. Look for the Mainsail programme to air on CNN International in December. It was only the first day, after having been onshore for five weeks undergoing significant performance enhancing modifications. And the wind was very light, rarely exceeding six or seven knots. And, for most of the day, the team performed largely mundane, but crucial tests, in the long, rolling, Pacific swell. But towards the end of the day's session, the sheets were hardened, the sails trimmed in and helmsman James Spithill turned the bows towards the wind. And wow! It certainly doesn't take much to make this boat move - fast. Until today, I'd only seen the BOR 90 on the water through the photography of Gilles Martin-Raget. And as great a photographer as Gilles is (and he certainly is), pictures don't completely do justice to this boat, which today, to my eye, always appeared to be straining at the leash, begging to be set free to run. As I mentioned off the top, this was a preliminary testing session, and the team wasn't looking to set the world on fire. But in the puffs, on this day, you could tell you were looking at a boat with a lot being held in reserve. For the record, on the testing session, design team coordinator Ian 'Fresh' Burns proclaimed himself satisfied with what the team accomplished on the day. "The engine worked beautifully, the winches were spinning around, everything went well. We put some new sails up and down and tried the new systems on the boat and just about everything passed the test. "It was a nice day. It was a rougher sea state, which wasn't ideal and posed some challenges, but the wind was light and we could pretty much pick our windspeed for the different things we had to do. "For the rest of the week we'll keep working up the load scale, finding more and more wind to sail in as we keep working on getting ourselves race ready." UPDATE: See a new YouTube video, including footage from Thursday's testing session. The BOR 90 is back in the water, the mast is up, and the team is preparing for the first testing session of the boat in its new configuration. Getting the boat ready after it's been out for five weeks of mods is a major undertaking. The new configuration includes - for the first time on this boat and the first time in the history of the America's Cup - an engine, following the Rules as issued by the Defender. The engine will be used to drive the hydraulic system and winches and essentially replaces the power the boat used to get from the grinders. Since the boat returned to the water on Sunday the shore team has been all out preparing it to sail. The mast went up on Monday afternoon, on Tuesday the daggerboards were put on board and each day has seen various work teams conducting load tests, engine, hydraulic and electronic system tests, each doing their bit to ensure the boat is fully prepared for sailing again. Depending on weather, Thursday and Friday are scheduled as sailing days, with all eyes on how the new modifications perform when the sailing team puts the hammer down. 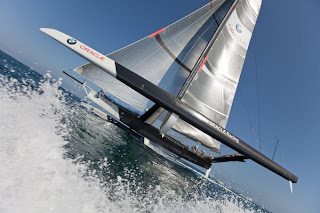 Hello and welcome to the BMW ORACLE Racing team blog, 2.0. The purpose of this team blog is to allow our friends, families and supporters to share the story of our challenge for the 33rd America’s Cup. It follows on from the very popular team blog - BOB - from the 32nd America's Cup. For all the official team news, you can visit our team website at www.bmworacleracing.com. If it’s videos of our team in action you'd like to see, why not check out our YouTube page here. But, as with the BOB in 2007, this blog is where you’ll find the more informal vignettes, ‘family snapshots’ and a behind the scenes view of our team and our campaign for the Cup. We aim to deliver a slice of life as it's lived by the team. And in the process, hopefully, you'll come to learn more about the men and women behind BMW ORACLE Racing. This 33rd America’s Cup challenge is like nothing that’s gone before in the long history of this storied competition. Both teams, ourselves and the defender of the America’s Cup, Alinghi, have built incredible boats, the likes of which have never been seen, nor sailed, let alone raced at the highest level of competition. Our boat, a trimaran known as the BOR 90, is a tribute to the imagination and hard work of our designers, engineers and boatbuilders. The process of testing and improving her is a testament to the courage and skill of our sailors. These are the stories of our team, BMW ORACLE Racing.